The content of this article provides interesting history, facts and information about the Emperor Philip the Arab and the all-powerful Caesars who ruled the empire of Ancient Rome. "Philip and Severa - the first Christian imperial couple"
Short Biography profile and facts about one of the most famous Romans of all, in the life of Philip the Arab, Emperor of Rome and provinces of the Roman Empire. Obtain a fast overview of the times of the Roman Emperor Philip the Arab from the following facts and information about his life. Why was Philip the Arab famous? Accomplishments, achievements and important events. The young Emperor Gordian III appointed Philip the Arab as his prime minister. The treacherous Philip the Arab then conspired against his benefactor and Gordian III was assassinated in Zaitha, Mesopotamia. Philip the Arab, having made peace with the Persians, returned to Rome, where he won the favor of the people by his mild conduct. Philip the Arab and his wife Marcia Otacilia Severa are considered as the first Christian imperial couple, because during their reign the persecutions of Christians had ceased and the couple had become tolerant towards the faith of the Christians. During the reign of Philip the Arab the secular games were celebrated, it being believed one thousand years since the foundation of the city. Philip the Arab dedicated himself to building the city of his birth, Shahba, up to a metropolis. The city was renamed Philippopolis and the emperor wanted to turn the city into a replica of Rome itself. Temples, triumphal arches, baths, a theatre and a great wall surrounding the city were all built based on the plan of a typical Roman city. Philip the Arab ruled with mildness and was an enemy to persecution. In A.D. 249, however, the Illyrian army revolted, and proclaimed their commander, Trajanus Decius, emperor, who defeated Philip the Arab near Verona, and put him to death. 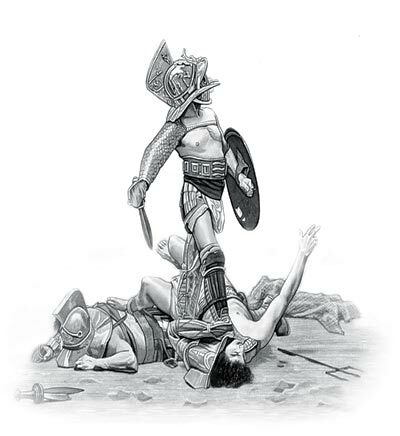 His son, who had remained at Rome, was slain by the Praetorian Guards. The Crisis of the Third Century was the period in Roman history following the death of Alexander Severus when Rome entered into the era of Military Anarchy commonly known as the Crisis of the Third Century. During the Crisis of the Third Century, lasting over 50 years, not one single Emperor died of natural causes. Revolts sprung up in virtually all of the provinces and ambitious men struggled for power. During the crisis there were civil wars, street fights between the citizens of Rome and soldiers of the imperial guard, fierce foreign enemies, plagues, famines, fire and earthquakes. The "Barracks Emperors" (238 - 268) were all military generals who seized power by force. Taxation was high, the economy was failing and Roman territories were being captured by barbarians and the Roman government was unstable. During this uncertain era and violent environment the promise of an afterlife seemed to be the only thing to hope for. And people started to turn towards a new religion, Christianity. The content of this Philip the Arab category in the Emperors of Ancient Rome provides free educational details, facts and information for reference and research for schools, colleges and homework. Refer to the Colosseum Sitemap for a comprehensive search on interesting different categories containing the history, facts and information about the lives and people of Ancient Rome.